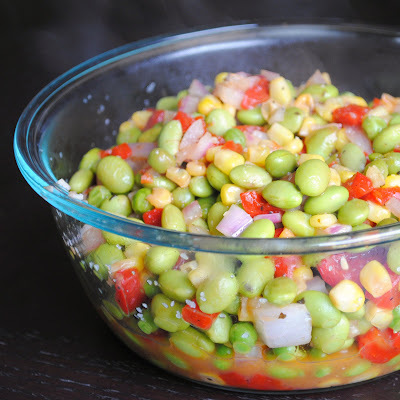 This is a super easy side dish that you can make to go along with pretty much anything. Its healthy and colorful and ready in about 5 minutes - what more could you ask for? If you haven't ever tried edamame, you should. 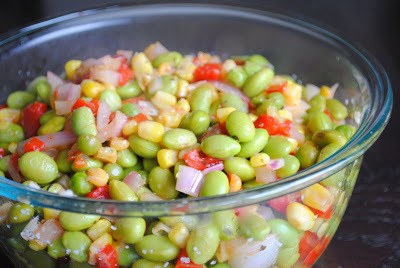 You can pick up a bag in the freezer section of shelled edamame and you just pop them in the microwave to cook. They cook in just a couple of minutes and sprinkled with salt they make a great snack or add them to all kinds of things. I had a bag in my freezer for quite a while that I wasn't really sure what to do with until someone told me how good they were on their own. You can add them to stir-fry dinners, mix them with couscous or pasta salads, or even add them to hummus or guacamole, although I haven't tried that yet. Add oil to a large skillet and heat over medium heat. Add garlic and onion and cook about three minutes. Add remaining vegetables and vinaigrette dressing. Cook about five minutes until vegetables are hot and vinaigrette reduces slightly. Transfer to a serving bowl and sprinkle with salt. 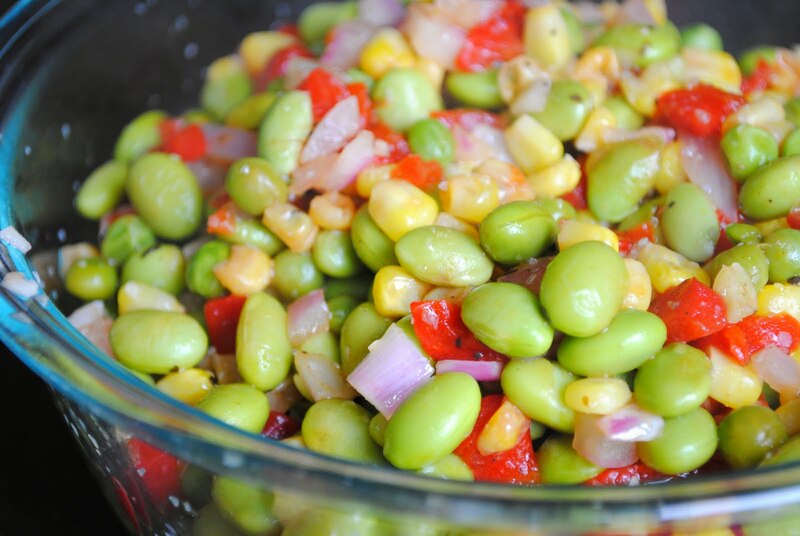 Note: If edamame, peas, and corn are frozen, microwave or thaw to room temperature first or increase cooking time. What a great, super healthy dish! My H would love this. I love edamame and I love the idea of incorporating it into a succotash! Looks great!